A great way to explore Halifax is by foot. The area is steeped in history and it is one of the most popular ports to enjoy a shore excursion. Take a historic walk through the stunning architecture Halifax has to offer. Halifax is the capital of the Canadian province Nova Scotia, and the largest Canadian city east of Montreal. Your local guide will explain how Halifax's landmarks the historical, cultural, political, and military significance the area has to offer. Here you will discover why it is known as one of Canada's best places to live. You'll hear of the tragedies and triumphs that have shaped the area of over the centuries. Places you will see on your tour include the Georgian-style City Hall, Province House and City Hall. Halifax is a city with a rich and fascinating history containing historic architecture. Halifax has a lot of Victorian feel around the city. Quite a few landmarks reflect its culture, while others show the political past, like the House of Assembly. 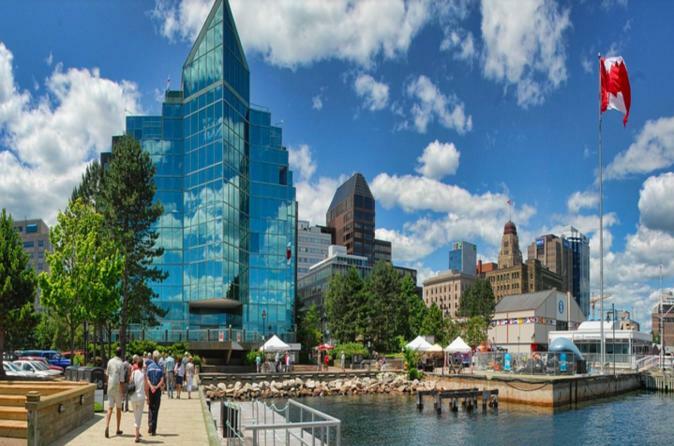 Halifax's offers a beautiful waterfront, here you will find compelling shops and minor monuments. These buildings of wood and stone are Canada's oldest surviving warehouses, and were once the heart of the city's shipping industry. Today, their historic architecture provides ballast for the somewhat precious boutiques and restaurants they now house instead. Another lively neighborhood runs along Spring Garden Road between the Public Gardens and the library. Here you'll find intriguing boutiques, bars, and restaurants along these 6 blocks, set amid a Bohemian street scene. Start on the waterfront and make your way to Spring Garden Road where Victoria settings meet award winning modern architecture with Halifax's new Central Library. At the top of Spring Garden Road is the Halifax Public Garden - the oldest Victorian style gardens in Canada. From the Public Gardens make your way up Citadel Hill, the major landmark of the city. A stone fortress looming over down town from a grassy height where a view from atop will give you an impressive overall picture of the surroundings. From Citadel Hill make your way downhill passing the Old Town Clock, City Hall through the Grand Parade, past Province House t and back to the o the Harbour to meet your cruise ship. This popular half day shore excursion is a great way to see Halifax's history with moderate walking involved.